Big Shot Video Slot Guide & Review - Casino Answers! Big Shot is a 5-reel, 20-line video slot featuring wild substitutes, scatter wins, a free spins feature with a multiplier and a progressive jackpot. 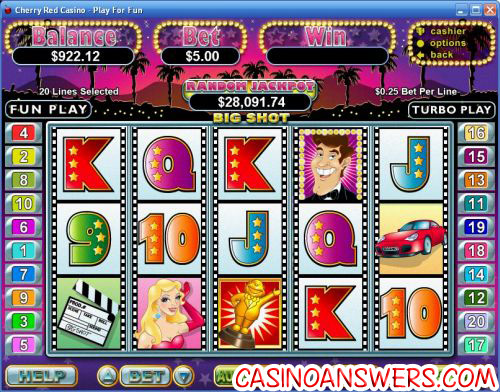 It is part of Realtime Gaming’s Real-Series of video slots. You can play the Big Shot video slot at US-friendly Slots Oasis Casino and Aladdin’s Gold Casino. Complete with its a movie star good looks, Big Shot brings you all of the glitz and glamour of Hollywood in the form of a video slot! The symbols on the Big Shot video slot all revolve around superstardom, including the Big Shot logo (bonus symbol), Award Statue (scatter symbol), Superstar (wild symbol), Diva, Red Sportscar, Roll of Film, Film Clapper and Ace, King, Queen, Jack, Ten and Nine symbols. The high card symbols all have stars to make them fit in with the theme of the game. Start playing the Big Shot video slot by first setting your bet (up to the $100 maximum bet) and your number of paylines (up to 20). Available bets per line are $0.01, $0.02, $0.03, $0.04, $0.05, $0.06, $0.07, $0.08, $0.09, $0.10, $0.25, $0.50, $1, $2.50 and $5. Casino Answers recommends leaving the active paylines at 20, but it is up to your personal preference. Once you are happy with your wagering settings, hit the “Spin” button to spin those reels! Big Shot features a randomly triggered progressive jackpot. The jackpot can be won on any spin you make. To increase your chances of winning, make sure to increase your bet. Progressive jackpot wins are added to other wins. Random Jackpot contribution is no more than 1.5% of total Return to Player. At the time of this writing, Big Shot’s Random Jackpot is currently at over $28,000! The top fixed jackpot on the Big Shot slot is 2500X your bet per line when you get 5 Diva symbols on an active payline. The Red Sportscar symbol is also a significant win at 1000X your line bet. Big Shot’s wild symbol is the Superstar symbol. The Superstar wild symbol only appears on reels 2, 3 and 4 and substitutes for all other symbols except for the Big Shot logo and Scattered Awards symbols. The scatter symbol on Big Shot is the Award symbol. It pays up to 100X your total bet. Scatter wins are multiplied by the total bet. All symbols pay left to right, except for the scatter symbol (which pays any). 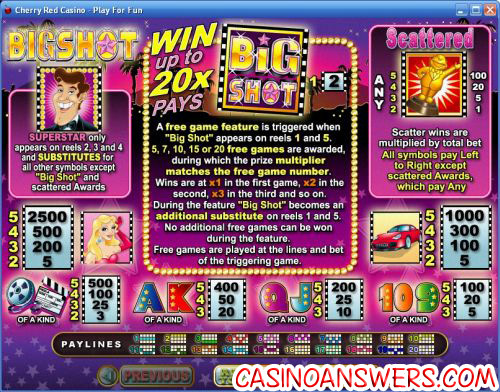 When the Big Shot logo appears on the first and fifth reels, you will trigger its free spins feature. You will be awarded 5, 7, 10, 15, or 20 free spins with a multiplier. The multiplier will be 1X for the first spin, 2X for the second spin, 3X for the third, etc. During the free spins feature, the Big Shot symbol becomes an additional wild substitute symbol on reels 1 and 5. No additional free spins can be won during the feature. Free spins are played at the lines and bet of the spin that triggered them. Do Big Shot’s reels spin too slowly for your taste? Not a problem. Big Shot has a skill stop feature. By hitting the “Stop” button that replaces the “Spin” button, you can stop all of the reels at any time. Another way to speed the game up is to go into “Options” and turn “Turbo Play” on. Another one of Big Shot’s features is autoplay. You can choose the number of spins (5, 10, 25, 50, 100, 250, 500 and 1000), to stop when the jackpot is won, to stop if a win exceeds or equals (any value up to $99999), to stop on any win you receive, to stop if your balance increases by (any value up to $99999), to stop if your balance decreases by (any value up to $99999) and to stop once the feature is triggered. You can cancel Big Shot’s autoplay feature at any time. Big Shot is a quality RTG video slot that definitely lives up to its name with a sweet progressive jackpot, a nice free spins feature and a fun theme. To play Big Shot and many other excellent video slots just like it, sign up and deposit today at Slots Oasis Casino and get a 400% signup bonus up to $4,000! Are US players able to play the Big Shot slot game? Yes, most RTG online casinos are US-friendly. Two of the best US-friendly RTG casinos where you can find Big Shot at are Slots Oasis Casino and Aladdin’s Gold Casino. These casinos both have excellent signup bonus offers, so we recommend you visit them both and see which one is best for you. For more details on Slots Oasis Casino, you can read our Slots Oasis Review. How do I win Big Shot’s progressive jackpot? Big Shot’s progressive jackpot is won randomly. All you have to do is play the game and you could be the one who triggers the Random Jackpot! Make sure to increase your wager to increase your odds of triggering the Random Jackpot. Does the Big Shot video slot have a special feature? In addition to the Random Jackpot, Big Shot also has a free spins feature. Trigger it by hitting the Big Shot symbol on both the first and fifth reel on a spin. You can win up to 20 free spins and a multiplier that increases with each free spin. What are some good random jackpot video slots? What are some jackpot slots available for Americans? What slot machines have wild cards, scatter bonuses and free spins?